Get Your Free 2018 PartnerShip Calendar! Can you believe that 2018 is just around the corner? To say "thank you" for your business over the past year we’d like to offer you a free 2018 PartnerShip Calendar! 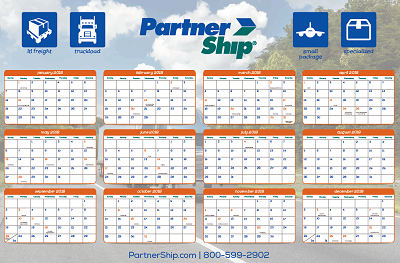 Simply fill out the short form below, and we’ll send you our annual poster-sized wall calendar in the next few weeks – compliments of PartnerShip – Your Shipping Connection! We look forward to another year of saving you money on every shipment you send and receive!